The next meeting of the Society takes place on Thursday 12th January 2017 at 7:30 pm in St. Andrew’s Church, Bilston Street, Sedgley. Members and visitors are invited to raid their toy boxes for childhood memorabilia collected over the years – from dolls & soldiers to Lego & the Rubik's Cube. The list is endless. Favourite board games begin with simple snakes & ladders to today’s epic A Game of Thrones! The fun of winning never ceases! 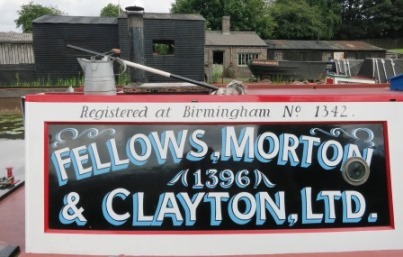 Black Country canal carriers proudly emblazoned the company name on both sides of the cabin. We asked which one of the three names had a Sedgley link. James Fellows was born in Upper Gornal, died in Tipton and was buried in All Saints’ Church old graveyard in Vicar Street, Sedgley. There is a memorial window in the church to James and Eliza erected by their children. He started the company in 1837 and after his death in 1854 Eliza continued the business until their son Joshua took the helm. Frederick Morton became an investor in 1876 followed a few years later by William Clayton joining with his fleet of boats. The three names first appeared on cabins in 1889. Business boomed until operating costs caused the whole company to fold in 1948.